“An important new book” (The Washington Post) on the long struggle to win voting rights for all citizens by the author of The Second Amendment: A Biography and president of The Brennan Center, a legal think tank at NYU. 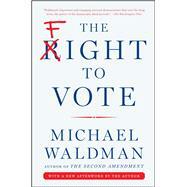 Michael Waldman’s The Second Amendment traced the ongoing argument on gun rights from The Bill of Rights to now. In this “timely contribution to the discussion of a crucial issue” (Kirkus Reviews), Waldman takes a succinct and comprehensive look at an even more crucial struggle: the past and present effort to define and defend government based on “the consent of the governed.” From the writing of the Constitution, and at every step along the way, as Americans sought the right, others have fought to stop them. This is the first book to trace the entire story from the Founders’ debates to today’s restrictions: gerrymandering; voter ID laws; the flood of money unleashed by conservative nonprofit organizations; making voting difficult to the elderly, the poor, and the young, by restricting open polling places. Waldman describes the precedents for these contemporary arguments. The fight, sometimes vicious, has always been at the center of American politics: from counting slaves but not permitting them to vote, to property-less males, then to free Blacks, women, eighteen-year-olds, and the disadvantaged, who were harassed by literacy tests. Now the right to vote is challenged by restrictions on open polling schedules and IDs, plus floods of money. It’s been a raw, rowdy, fierce, and often rollicking struggle for power. The Fight to Vote is “an engaging, concise history…offering many useful reforms that advocates on both sides of the aisle should consider” (The Wall Street Journal).